FREE DELIVERY! Fiddes Supreme Wax Polish contains a unique, environmentally friendly blend of waxes that naturally enhance the beauty of your wood. 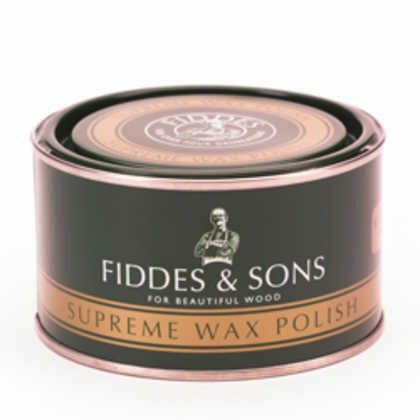 Formulated to offer excellent results, Fiddes Supreme Wax Polish contains a unique, environmentally friendly blend of waxes that naturally enhances the beauty of your wood. We’ve carefully selected Rugger Brown as the colour we sell as it works with all shades of our furniture. As long as you’re not waxing onto bare wood, it won’t affect your furniture’s colour. The Supreme Wax range exhibits significant advantages over many traditional toluene based wax polishes. Supreme Wax is virtually odour free, easy to apply, and once buffed to the desired sheen level, provides a depth of finish that revives and protects any original patina.